Baby girls off white lace dress, headband & shoes. 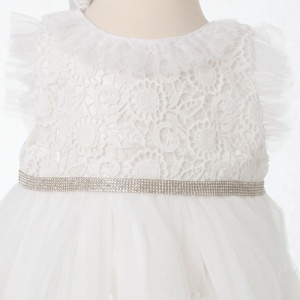 Perfect for her christening or for a baby flower girl. Dress: This beautiful off white dress has a sleeveless taffeta bodice with an embroidered lace overlay and soft frilly tulle peaks on the arm. A zip fastening is to the back. A diamante trim is to the waist to capture the light. The soft tulle layered skirt has embroidered floral motifs, with satin and cotton underlay. 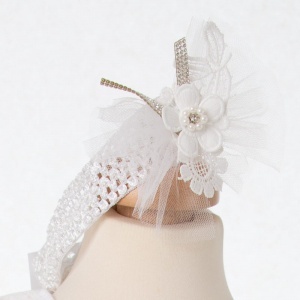 Headband: Off white crochet headband with matching soft tulle, diamante trims, embroidered lace motif and a flower adorned with pearl and diamante centre. Shoes: Off white soft satin shoes decorated with matching diamante trim to the velcro strap. A large bow sits on the front with an embroidered lace motif and flower adorned with pearl and diamante centre, with a cushioned soft & flexible sole. Please ensure all measurements have been checked prior to purchase to ensure you select the correct size.